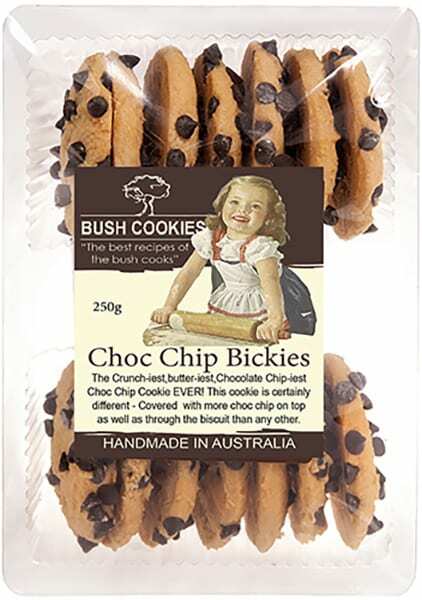 Choc Chip are almost universally popular and one of the best selling cookies by Bush Cookies. In Sydney you can find Bush Cookies stocked at The following discerning retailers: Harris Farm Markets (all Stores), IGA Allambie Heights, IGA Wentworth Point, IGA Ellanora Heights, Fruitezy (Miranda, Chatswood & Chatswood Chase), Parisis Foodhall Rose Bay, Fourth Village Mosman, Riverview Deli, North Steyne Emporium, Willoughby Fresh, IGA Penshurst, IGA Warriewood, IGA West Pymble, Greenwood Grocer. Buy them wholesale from Opera Foods.